There have been about four substantial snow falls this winter, and I haven't had anything warm to put on my feet during any of them. 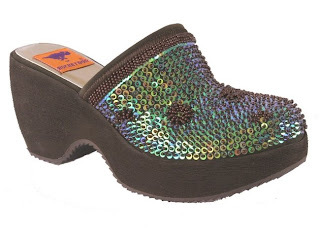 My go-to shoe has been my beloved sequined clog I got in 2005. They have a super high platform and some deep treads, which is why I deemed them appropriate for schlepping through snow. But last time I wore them, I slipped going up the stairs because one fell off my foot, and there was much miserable coldness. 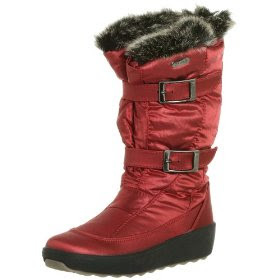 I decided I wanted some real snow boots, something that would truly keep me warm and dry and insulated. It was then that I found this company, Pajar. They are a Canadian company, and their website claims the boots will withstand up to -74 degrees Celsius. What's the conversion on that? Something like 0 degrees Fahrenheit? These Sled Boots have been in an out of stock at Amazon for some time. I've been watching. When I saw they were back today, I pounced on them. They were $90, which isn't horrible considering they are real, proper snow boots and will last for many, many winters to come. Plus, with their fur lining and cute buckles, I dont' believe they will go out of style, Unlike the Ugg, Which went out of style in 2002, but everyone chooses to ignore that. Also, what good is a suede boot in the snow? These are nylon and waterproof. As an extra bonus, these boots were made in Romania, not China - something I'm becoming increasingly more aware of. PS. In regards to my new years resolution, it has been exactly 27 days since my last purchase of shoes, which is close enough to four weeks to constitute a month. And I'm already looking forward to March 18th!